john4jack (Corvallis, Oregon, United States) on 16 November 2009 in Transportation and Portfolio. As mentioned at the beginning of this series, the main reason we were in Sumpter was for the photographer's tour on the Sumpter Railroad (narrow gauge). I mentioned the Heisler engine (No. 3) in the first photograph of the series. No. 19 is a steam engine that carried freight cars. They would take us a ways; dump us out, and then run the trains back and forth. This must have happened at least 20 times during the day. The crew of mostly volunteers who are train fanatics was incredible in the work they did for us. what a great photo. i love it! The light is spectacular, beautiful! What a beautiful locomotive! I love the tones and the light. Fantastic work Jack!!! The colour is just wonderful and superb for this shot! This photo and the colors you have used are remarkable. It must have been an unforgettable trip. Glad you are sharing it with us !! Love the warm tones here. And the smoke adds great feel to the image. Brilliant colours..a nice bit of steam to get the train up...looking good! I love the tones and light in this. A picture surreal and timeless! beautiful tone! smoke adds more photo film! Superb! Really a superb picture Jack ! 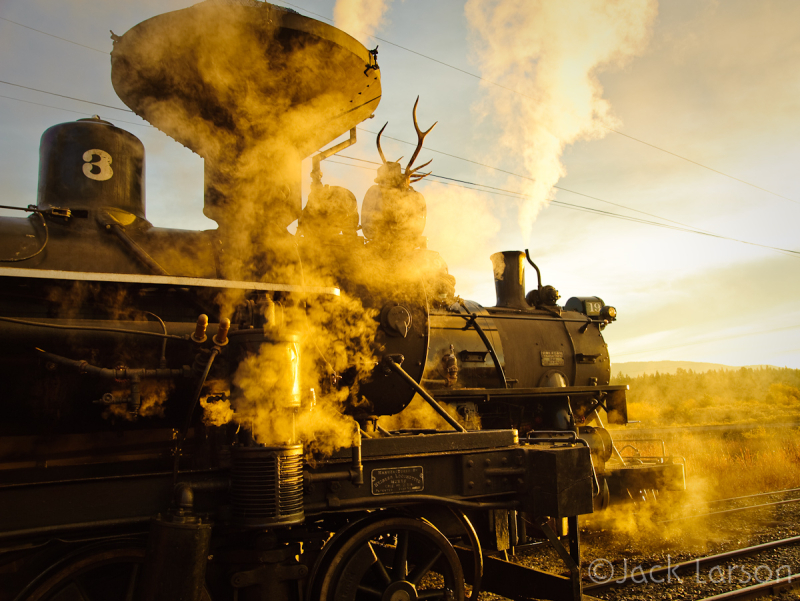 Golden steam! Never seen! Well done! I was impressed by the brave figuer of the steam engine. Great shot ! great framing and fabulous colors ! wow ! I love it ! And now, it's time to travel... I'm ready ! It's beautiful Jack ! @Peggy M.: Come to Oregon. I promise you a great time. Love the colors and lights. @Audrey: Merci. I wish that you were on Am3. This is wonderful and is justifiably drawing attention! I love how you captured so much steam. a super shot. i love the colors! Great shot and tones. Is that antlers on top?? @B. Thomas: Thanks. Yep, antlers. Nice angle from which you have captured this engine. The color reflected in the steam gives this a "sepia" and "aged" look to it. Now this is a great photo for sure. The tones and colors are beautifully done, but I really love how you captured the steam. Absolutely wonderful! Dynamite light & subjetc, one of my favorite image at your place, not only because I love everything related to train but due to the over cinematic mood, the steam is so gorgeous in that honey-like lighting, I would not be surprised to see Vivien Leigh or Bette Davis or Gary Cooper (and why not the whole trio ? Let's be crazy ! :) entering suddenly your splendid frame ! Brilliant shot and wonderful light.Well done. qualities. I thoroughly enjoyed your picture. @don: Thanks, Don. Everything was for the photographers that day. @Evelyne Dubos: Merci. The light that morning was phenomenal. Beautiful photo of those magnificent machines. Love your angle and the lighting on this, Jack. Also like the antlers on the front of the engine. @LauraS: Thanks. I agree with you on the antlers. @k@: So delighted to help take you on your wonderful nostalgia trip. @Luca Bobbiesi: Thanks. "yellow smoke" - the sun working its magic! A shot straight from the days of yesteryear. This is fantastic. You went on a great adventure. @Steve Rice: Thanks. And, yep, a terrific trip. Very nice capture. Have a good day. Antoine. me encanta la composición y el color de esta foto, buen trabajo! Sounds like an incredible day to be a photographer....and a wonderful place to one in......the light in this shot is just glorious...those gold tones give a real warmth to the shot.....Great Job, and look forward to more from this shoot!! Very nice and atmospheric. Love the steam billowing out of the chimney. @Mirza Ahmad: Thanks. Me, too. Dear Lord!!! Most effectively powerful composition. This is fantastic light with the steam and I feel like I have stepped back in time a hundred years looking at this! Awesome work on this series! This is wonderful--I love that gold light! I'm a big fan of trains! Beautiful light especially on the steam. Great atmosphere. Very impressive capture on tones. There is something special about seeing these old engines in action. Amazing image. I looove the smoke. The light in this shot is incredible! Gorgeous light and steam! Beautiful work jack! @daniela scharnowski: Thanks. On the antlers, you asking the wrong guy; I don't have a clue. Now...that steam did the image for you! Timely and the result is amazing! Plus the light! superbe atmosphère dans cette scène d'autrefois !